Thousands gathered this past weekend to watch the adrenaline-fueled action of X Games Minneapolis 2018. Nine Saint Mary’s University students were also in on the action‚ working on site and gaining knowledge in fan experience, business operations, sports marketing, and more. Through the X Games Student Work Program sophomores Isabel Bettag, Hannah Crowe, Courtney Moser, Grace Mulcahy; juniors Blair Sanders and Spencer Smec; seniors Caroline Hoffman, and Alyssa Thiel; and 2018 alumna Sarah Egbert received valuable first-hand experience to put on their résumés. Taking place this year July 19-22 at the U.S. Bank Stadium, the X Games brings top athletes in sports such as skateboarding, BMX, Moto X, and more from around the world to compete. Saint Mary’s was one of only four schools chosen to participate in the Summer X Games Student Work Program. All Saint Mary’s students were assigned to work at X Fest, the outdoor action sports festival experience that showcases vendors and fun activities. Although it was just for a few days, the students say this experience is sure to help in their future careers. In addition to participating in the Summer X Games Student Work Program, Saint Mary’s students have been actively engaged in an online class for the last two months with Zakary Mayo, assistant professor of business for Saint Mary’s. As part of the class, students participated in weekly video conferences and discussions to receive a blend of theory and experiential learning. The course was intentionally designed to provide students with the appropriate level of training, orientation, and knowledge necessary to successfully implement learned concepts into real-world scenarios. “Students in the X Games Student Work Program gained real-life experience in managing and executing extreme and action sports events, including experience in hospitality, venue operations, sponsorship activations, and more” said Mayo. Sarah Egbert graduated last spring with a degree in biology pre-physical therapy and a minor in sport business. She was drawn to the X Games internship because she eventually wants to work in a sports arena as a physical therapist. Along with learning the ins and outs of the sport management field and getting to watch top professional athletes compete, Saint Mary’s students interacted with fans, young and old, who tested their skills on the vert ramp, mini ramp, mini skate park, and more. Some fans were even lucky enough to ride or skate with the pros and get autographs. 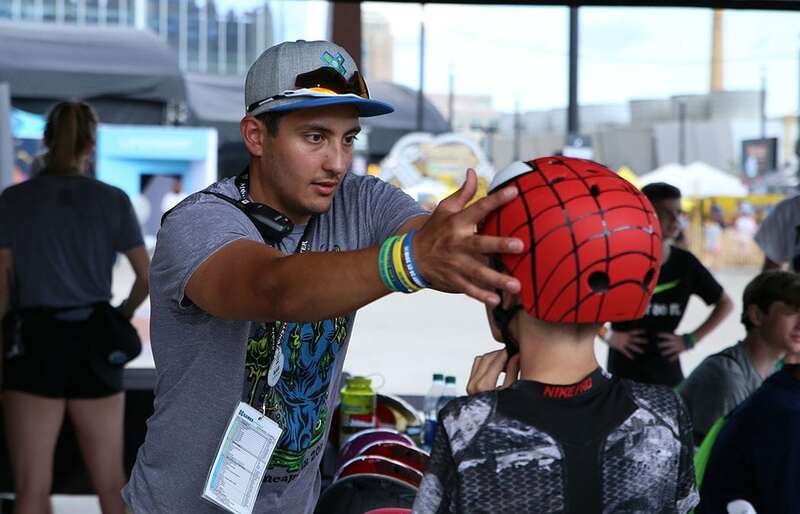 Photo caption: Saint Mary’s junior Blair Sanders works with youth at the X Fest through the Summer X Games Student Work Program.